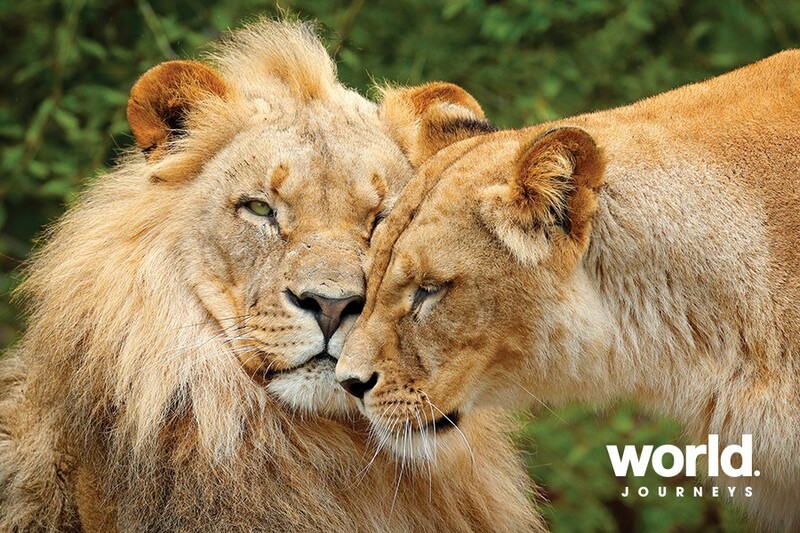 Join us for the safari experience of a lifetime! 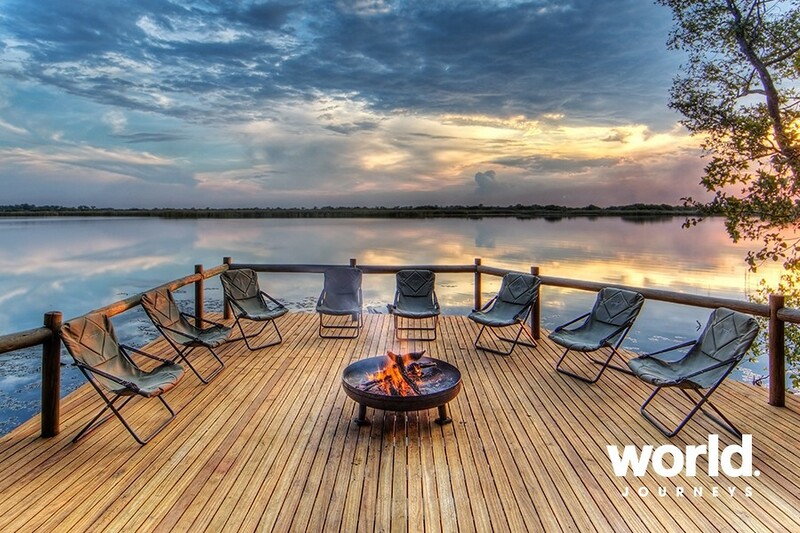 Once in Africa, we take you to the magical water wonderland of the Okavango Delta, before heading to Chobe National Park for excellent game viewing and sunset cruises. Stay at the legendary Victoria Falls Hotel in Zimbabwe, with landscaped gardens that overlook the falls. 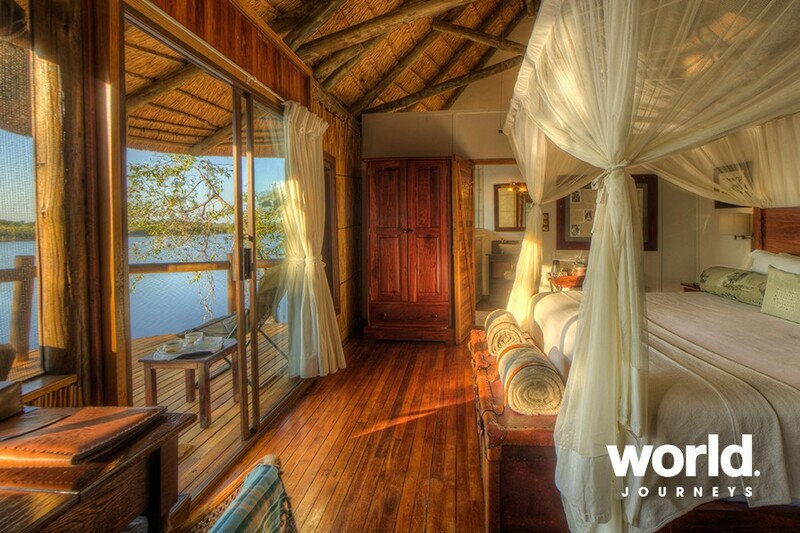 Have lunch at a café perched above the Batoka Gorge and cruise on the mighty Zambezi River. From here we fly to Namibia where our expert Namibian guides make our stay in their country truly extraordinary. Learn from them about desert adapted rhinoceros, ancient geology and dark sky reserves; this country is so very special. Try your hand at fishing in the Okavango Delta Dine on the camp's 'floating deck' under candlelight and the chef will cook up your catch for dinner! 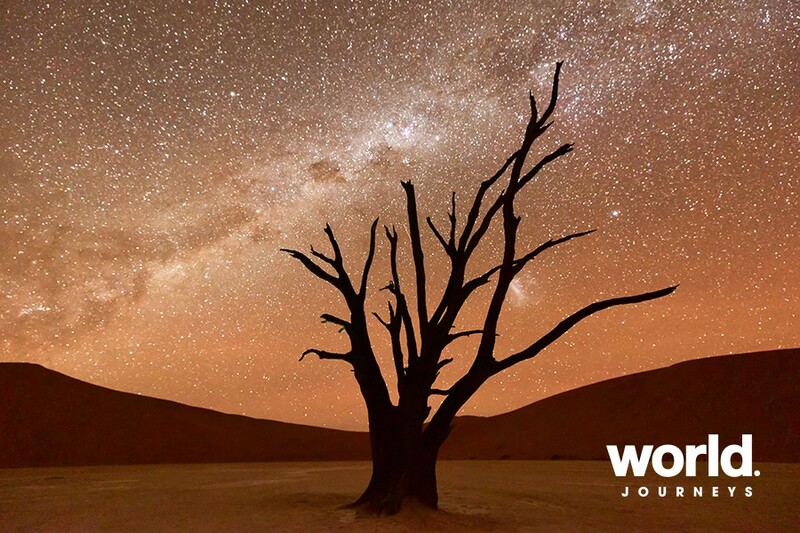 Star-spotting of the natural kind in the Namib Desert with expert guides This part of Namibia is officially recognised as one of 12 'dark sky reserves' worldwide - another being the Aoraki McKenzie in New Zealand. A very special visit to AfriCat Foundation AfriCat organise the largest rescue and release operation of cheetah and leopard in the world. 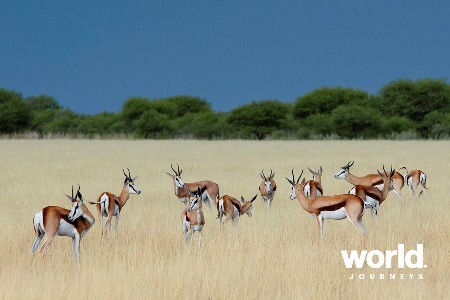 See them in their natural habitat on the 20,000 hectare Okonjima Nature Reserve. Travelled on one of our Journeys before? We would like to offer you a saving of $400 per couple (or $200 per person) if you book this journey. Mon 10: Auckland > Perth Meet your host and fellow travellers and fly to Perth. Overnight Perth. Tue 11: Perth > In Flight Day at leisure before our overnight flight to Africa. Wed 12: In Flight > Maun > Okavango Delta (D) Arrival in Maun. Light aircraft transfer into the spectacular Okavango Delta. Spend three nights at Xugana Island Lodge, situated on the Xugana lagoon. Thu 13 & Fri 14: Okavango Delta (B,L,D) Enjoy safaris with your guide by day and night game drives in the private concession, explore the crystal-clear waterways by motorboat or mekoro (dugout canoe) and guided walks. Sat 15: Okavango Delta > Chobe National Park (B,L,D) Light aircraft flight to Kasane and transfer to our lodge in the Chobe National Park. Spend two nights at our lodge which overlooks the Chobe River, where you are able to watch the wildlife parade from excellent viewing decks. 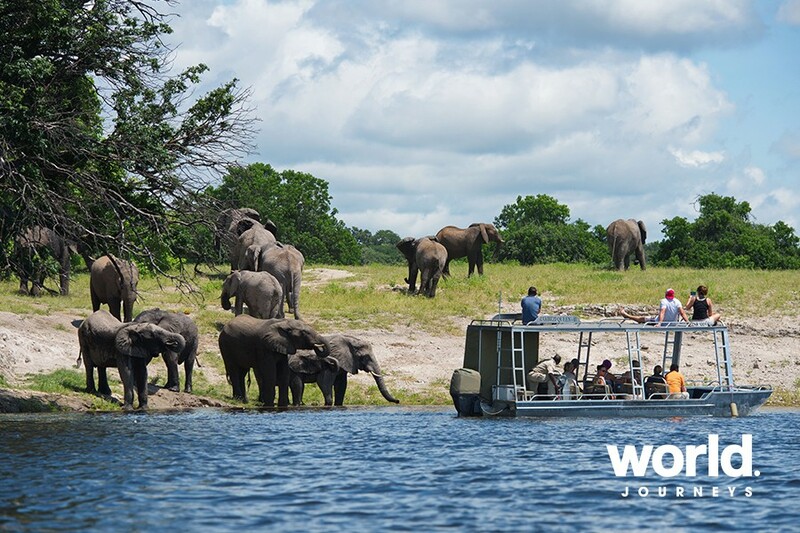 Sun 16: Chobe National Park (B,L,D) Enjoy safaris with expert guides, both on land in open 4x4 vehicles and on the Chobe River in a motorboat. Mon 17: Chobe National Park > Victoria Falls (B) After an early morning activity, we transfer to Victoria Falls. 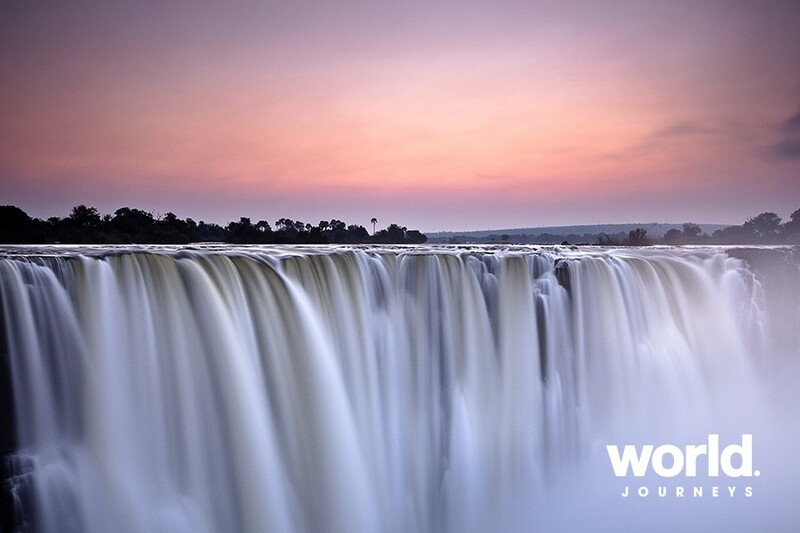 Locally known as Mosi-oa-Tunya, 'the smoke that thunders', the sight of the falls will take your breath away! We spend three nights at the historical Victoria Falls Hotel. Tue 18: Victoria Falls (B,L) After a guided tour of the falls, we lunch at a cafe overlooking the Batoka Gorge. Cruise the Zambezi River this evening, toasting another beautiful African sunset. Wed 19: Victoria Falls (B) A day at leisure. Perhaps take the day to relax, or take an optional excursion such as a helicopter flight or a tour to the Zambian side of the falls. We highly recommend the high tea served on the lawn of the hotel! Thu 20: Victoria Falls > Windhoek (B,D) Transfer to the airport for our flight to Windhoek, Namibia. We overnight in a boutique guesthouse and enjoy dinner in town with our expert Namibian guides tonight. Fri 21: Windhoek > Okonjima (B,L,D) Set out for Okonjima today, stopping at the Okahandja craft market en-route. 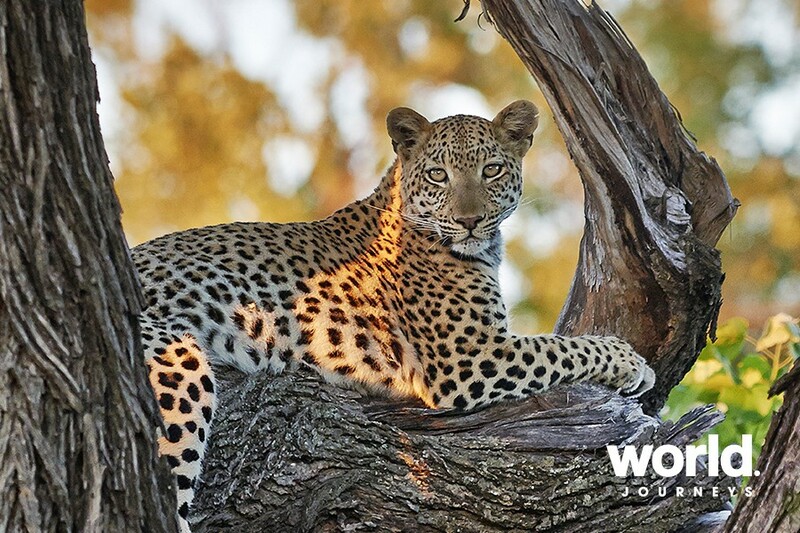 Okonjima is home to the AfriCat Foundation and in the afternoon we head out with a specialist guide to learn about their programme and view leopard and cheetah in their natural habitat. Sat 22: Okonjima > Etosha National Park (B,L,D) Drive to Etosha today, reaching our camp at the Ongava Game Reserve for a late lunch. 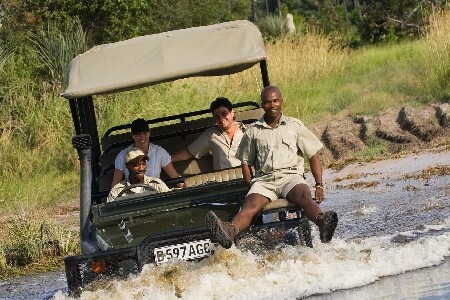 This afternoon you have the option of joining a shared sundowner game drive offered by the lodge. 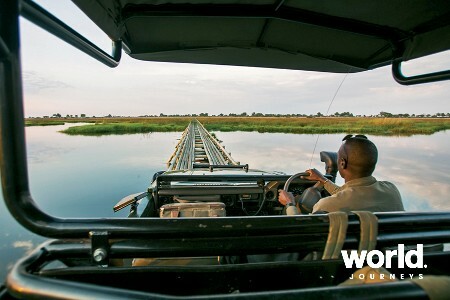 Ongava Game Reserve borders Etosha National Park, offering exceptional wildlife viewing in a more exclusive setting. 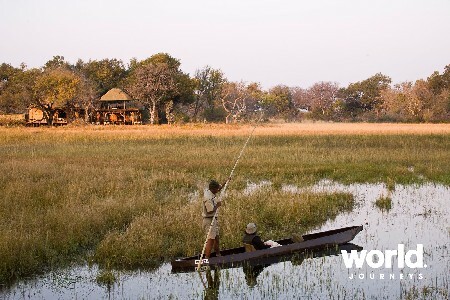 It also overlooks a waterhole where guests can enjoy the interaction of wildlife both day and night. 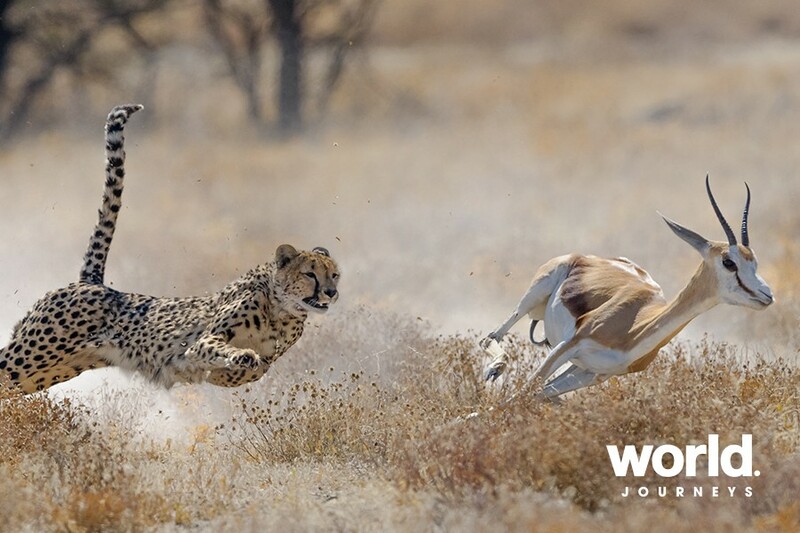 Sun 23: Etosha National Park (B,L,D) Morning guided safari in the southern section of Etosha National Park. Etosha National Park, known as the 'Place of Mirages' or the 'Great White Place', covers 22,270km2, of which over a quarter is made up of salt pans. The largest of these pans, the Etosha Pan, can be classified as a saline desert. Your guide's knowledge of these areas is a major asset. 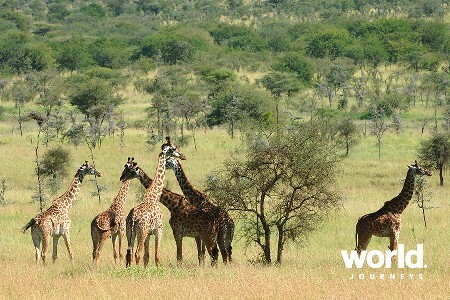 Enjoy lunch and relax at the camp before another option to join a shared sundowner game drive. 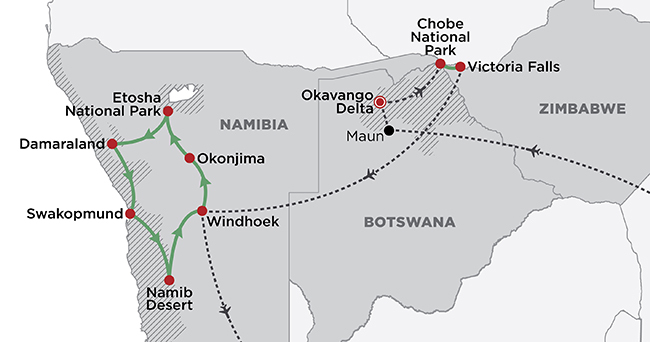 Mon 24: Etosha National Park > Damaraland (B,L,D) A day's drive today takes us into the heart of Damaraland. Visit a local school before continuing to your 'under canvas' camp, your home for the next two nights. Tue 25: Damaraland (B,L,D) Stay in great comfort with safari 'magicians' providing expert guiding, delicious food, and thrilling encounters with desert-adapted elephants. 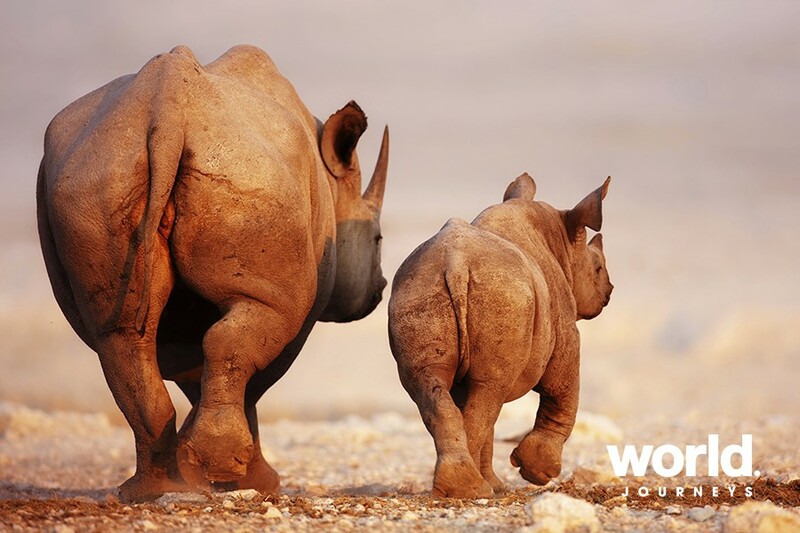 Track black rhinoceros with Save The Rhino Trust guardians. Enjoy evenings around the fire with drinks and a convivial atmosphere. Wed 26: Damaraland > Swakopmund (B,L,D) Today we drive to the quaint coastal town of Swakopmund, which has a strong German history. Enjoy an afternoon at leisure before dinner at a good local seafood restaurant. Thu 27: Swakopmund > Namib Desert (B,L,D) Travel south towards Sossusvlei, visiting Sesriem Canyon en-route if time permits. The next two days will be spent exploring the remarkable Namib Desert. In 2012, the area was proclaimed an official dark sky reserve, and your guides will enjoy showing you their view of the stars. Fri 28: Namib Desert (B,L,D) Today's morning excursion will be to the apricot-hued dunes of Sossusvlei, stunning in the early morning light which accentuates some of the highest free-standing dunes in the world. 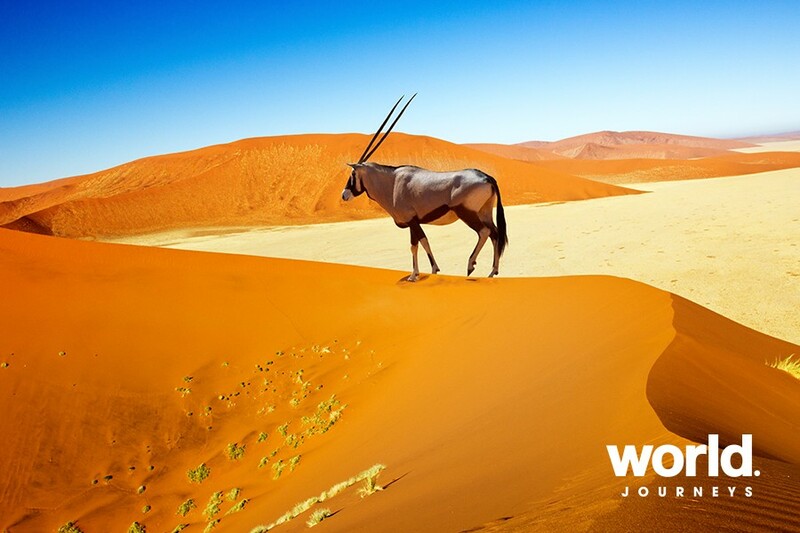 Explore the dunes and walk to Deadvlei with its striking white pan and camel thorn trees, enticing even an amateur photographer for that perfect Instagram moment! Sat 29: Namib Desert > Windhoek (B,L,D) Travel to Windhoek, arriving in the afternoon. 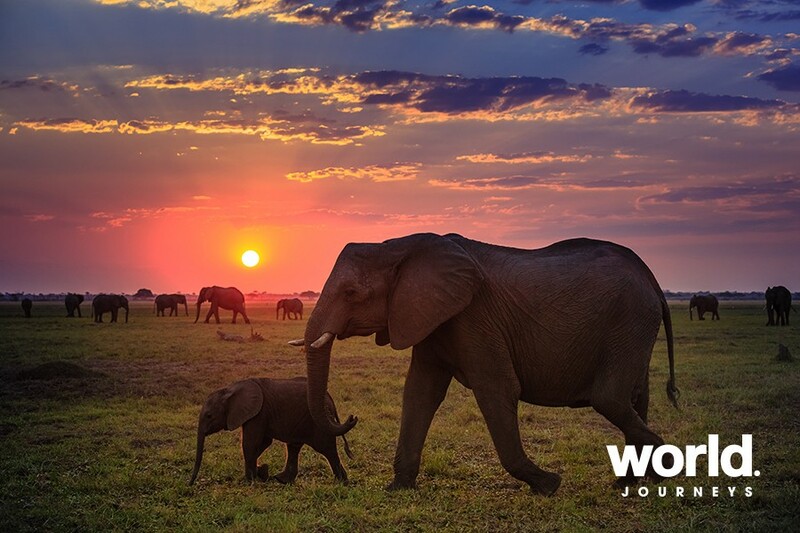 Enjoy a final dinner with your fellow travellers and Namibian guides. Sun 30: Windhoek > In Flight (B) The morning is at leisure before our flight from Windhoek to Johannesburg and onwards to Perth. Mon 01: Perth > Auckland Transit in Perth before our onward flight to Auckland. Tue 02: Auckland Early morning arrival in Auckland. • A non-refundable deposit of $3,000 per person is required, with the balance due 15 March 2019. • As cancellation fees apply, travel insurance is mandatory. *Business class upgrade applies to Auckland > Perth > Johannesburg > Perth > Auckland and is subject to availability.